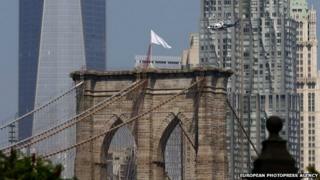 Two German artists have claimed responsibility for hoisting white flags on New York's Brooklyn Bridge last month in place of official US flags. The act was a celebration of public art in the "global centre of creativity", the Berlin-based pair said. It also marked the anniversary of the death in 1869 of the bridge's German-born architect, John August Roebling. The overnight stunt mystified police and exposed security flaws. Police said they were looking into the claims. Officials earlier said they would not treat the act as a joke or statement. The white flags were placed on top of the two stone towers at either end of the landmark bridge and flew for several hours before police took them down. In a statement, the Berlin-based artists Mischa Leinkauf and Mattias Wermke said White American Flags was an art project, the latest in a series taking place in urban environments. They said they had been careful to treat the bridge and the flags with respect and that the return of the originals was "in progress". In the minutes leading up to the switch, in the early hours of Tuesday 22 July, up to five people were caught on CCTV on the bridge. At 05:30 local time, construction workers on the bridge noticed the American flags had been replaced with the white flags. Trained police climbers found and removed two large flags - 20ft (6m) by 11ft - which appeared to be American flags with the red stripes and blue canton bleached white. The security gates under each tower were in place and remained locked when authorities arrived on scene. Speculation raged on social media about who was behind the act and its symbolism - with supposed suspects ranging from cyclists to aliens. However some posters pointed to the work of US artist Jasper Johns, whose White Flag painting belongs to the Metropolitan Museum of Art.